Note that the units parameters include it's translated names, which makes 'drastic' modifications a bit of a pain (even with the help of Google translate :-) ) if you want to maintain the translations. Units are defined only once. Both players have exactly the same unit types and unit definitions (the only difference is the 'icon'). Note that, just like Terrain Tile icons, the Unit icons can be 'double used' (i.e. you can define multiple different Unit parameter sets, with different names, that use the same icon - for example 'Spitfire' and 'FW190' could both use the same 'fighter' icon). When unit icons are 'painted' over the background (terrain tile) hex's, the terrain tile 'shows through' those parts of the unit icon that are 'transparent'. This is achieved (in CFUnits.bmp) by using the 'pink' colour RGB=212,0,254 (.bmp palette no. 0) as 'transparent'. 'mkunitset' checks the unit definitions in the .usrc file and creates (& saves) a complete definition 'set' for each unit (filling in with defaults as needed). It also adds the name of the 'movement sound' (.wav) file to be used for that unit. It then saves the 'icons' .bmp file as a single image 'block' and finally adds the unit portraits (if any). The compiled maps (*.lev) use Unit ID code, whilst the map source (*.src) use the units (English) name. Unit ID codes are created automatically (sequentially) when the default.units file is 'compiled' from the definitions (default.usrc file) and icons (CFUnits.bmp) files. If you change the names, then opening a '.lev' in CoMET will pick up the new names (and saving as .src will change the old names to the new ones). Of course, trying to compile an old .src into a .lev will result in 'unit name not found'. Indicates the start of the definitions set. Appears once. Indicates the start of an individual unit definition. There will be as many [unit] definitions as there are units. Units do not have to be defined 'sequentially' - the icon number to be used is part of the definition. However, the Unit ID, which is created automatically when the definitions are complied, is assigned sequentially. So (unless you want to recompile all the existing maps) any new new units must be added to the end of the definitions file. The name of this unit (in each language =). The name is used to identify the unit in the battle maps definition (.src) files, however the compiled maps and saved games (.lev files) use the Unit ID code (which is created automatically when the definitions are complied). This means you can change unit 'names' without needing to recompile the maps, HOWEVER if you do change the (English) name, unless you also change it in the map .src files, those maps won't compile .. This units' basic 'type', one of 'ground', 'ship' or 'aircraft'. This defines the unit's 'vulnerability' - for example, a 'type = ground' unit can only be attacked (or counter-attacked) by other units that have a 'power(ground)' capability. *** there is no special 'type=' for transport units. A transport unit is any unit that has a 'transslots' parameter value (see later). **** 'repair' uses 5 'crystals', which have to be 'on-board' the transport at the same time as the unit being repaired. Repair always costs 5 'crystals' and always takes 1 turn, no matter how damaged a unit is. The bit-map to be displayed (from the CFUnits.bmp) for this unit when 'north facing'. 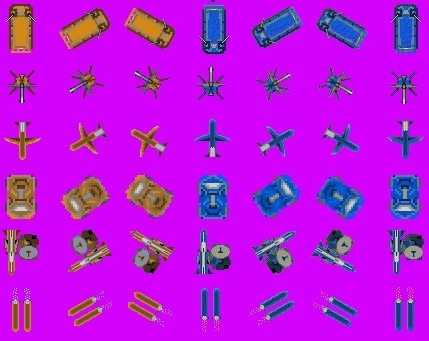 There are actually 12 bitmap icons for each unit, two sets (one in each players color) of 6 (one for each possible facing). **units can be 'pre-deployed' (using CoMET) onto terrain of 'type' they are 'not allowed' to enter = you will get a 'warning' ('unit N walking on invalid terrain') when you 'validate', however cfed will still 'compile' the map (to a .lev file) OK. When calculating moves, the 'cost' of entering each Tile is deducted from the Units movement 'allowance'. Movement ends when the unit has insufficient allowance left to enter the next tile. This is because river tiles are defined as 'shallowwater' that normally only ship types would be allowed to enter. So the fact that the 'cost' of moving in shallowwater was less than the 'cost' of moving on land tiles didn't matter .... until I allowed a land unit into water ! To prevent the AI choosing to move it's tanks 'up river', I had to adjust all tiles with one of the 3 'water' types so that movement through them cost more than moving over land. This then required I adjust the movement 'allowances' of all 'ship' units to compensate. Movement allowance per turn (can be 0). Note that the initial cost has no effect on the 'repair' cost, which is 5 'crystals', no matter what the damage or the original 'cost'. This units 'attack' capability against each of the 3 main unit 'types'. When no (range) is given, the range defaults to 1. If no 'power() =' is defined against a 'type', the unit can't attack (or counter attack) that type (mkunitset.cpp sets range=0). Transport is one of the most flexible parts of Crimson Fields - it allows all sorts of 'clever tricks' to be pulled, from Field Repair to Demolition Engineer units and Missile Batteries to Pontoon Bridge layers. The 'minimum' weight of a unit that can be carried by this Transporter. Of course in 'real life' Transports would have no 'minimum' limits, so it's a bit unrealistic, however this (togther with maxweight) allows you to control what a 'transporter' is 'allowed' to carry. This prevents Boats, Transport Planes and APC's which can carry 'transslots' worth of 'low weight' units (so multiple Infantry) from carrying a single Heavy Tank or Artillery piece etc. The bit-map 'cartoon' image to be shown when the 'details' option is clicked for this unit. This page last modified: 15th Sep 2017 07:36. Page Clicks to date: 2. User 54.90.86.231 @ ec2-54-90-86-231.compute-1.amazonaws.com.